Sports equipment companies like to make the everyday Joe Athlete feel like he’s Dwight Howard. Not in terms of talent — unless Nike or Under Armour or another entity is developing some sort of radical garment I’m not privy to — but in regards to how someone dresses when exercising. It’s an empowering feeling for a weekend warrior to witness Howard or another pro athlete working out in a shirt or a pair of shorts in an advertisement, then to wear that same gear to the gym hours later. Now, Adidas is giving folks the option to dress like a pro athlete not only during a workout, but after one as well, via a new line of Recovery garments specially made to help you bounce back from the drain of physical activity. Adidas’ various Recovery compression tops, long and short tights, arm and calf sleeves and socks build upon the German giant’s TechFit line of training garmets, operating under the same principle but improving the form and materials. You may already be familiar with compression gear, as several manufacturers are making them. These special, tight-fitting threads are intended to improve blood circulation and oxygen flow in key parts of the body. Improved circulation speeds up the rate at which lactic acid, which builds up during a workout, is forced out of those areas. The result is a reduction in muscle soreness and fatigue. Here’s the point where you’re probably asking yourself, “Yeah, but does it work?” The answer is yes — sort of. To call it compression gear doesn’t do justice to how tight the fit is. The Recovery long-sleeve top ($60) and pair of long tights ($65) took an unusual amount of coaxing for me to fit them over my 160-pound frame. (I’m definitely not built like Dwight Howard.) They were decidedly uncomfortable at first. I felt as though I should’ve had a bunch of white balls attached to me for motion-capture analysis. Ten minutes later, I was surprised to find the top and the tights had grown much more comfortable (Adidas recommends you stay suited up for 20 minutes). Since the gear is literally skin-tight, some strategically-positioned vent pockets have been added to encourage air flow and to prevent the body from overheating. Detecting the areas of compression is easier with the top than for the tights. The biceps, back of the shoulders and the areas underneath the armpits — the lats, or latissimus dorsi muscles — were most noticeably compressed. The two big air vents in the lat areas, as well as one in the middle of the back, provided a pleasant cooling sensation as I walked around my apartment. And there is the rub: You don’t necessarily have to channel your inner-Clark Kent and swap your gym garb for Recovery immediately following a workout, but it behooves anybody seeking maximum benefits to change into their Recovery items of choice rather soon after exercising. That can be a turn-off, especially if your workout routine involves showering as quickly as possible and slipping back into business casual mode. Adidas says the company’s own research (performed in a sponsored study at the University of Calgary) shows its gear helps increase the post-workout recovery process by 5.1 percent and delays fatigue by 5.6 percent. Since the study was funded by Adidas, you should take those numbers with a grain of salt. But other studies have arrived at similar conclusions. Regardless, if you can accurately gauge that you feel 5.1 percent more recovered from a strenuous cardio session by sporting Recovery gear, then you’re far more adept at understanding your body than I am of mine. I had slightly less muscle soreness than I remember having before I tried Recovery, but I can’t say with confidence that the gear had a noticeable effect. Of course, I can never tell how effective it is to drink water after a workout, or how many times my stretching routine has prevented an injury. My assumption is those methods of protection work, just as I suspect people might assume Recovery improves blood circulation and oxygen flow to stifle oncoming muscle soreness and fatigue. My view is that unless you’re a serious athlete who engages in high-intensity workouts, Recovery won’t provide the benefit for you that it does for, say, Dwight Howard. WIRED Vents bring in air flow for cooling effect. 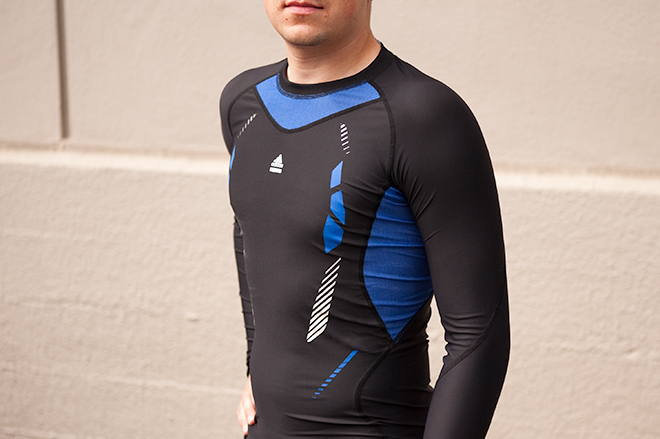 An easy transition for people who wear compression gear while exercising. Colors are bold and designs are interesting without looking too tech-y. Surprisingly comfortable to wear after a few tries. TIRED Expensive. Difficult to put on and take off. Awkward to wear in public during post-workout errands. Might feel like another post-workout chore. Could feel stifling for those inexperienced with compression clothing.